A quick glance over at the masking tape garbage stack, and I see that several layers of masking has created the mother of all shrapnel piles. Not-so-quick diversion. I'm itching to assemble the cavalry pieces for the Damiano tier list. So, these two units of heavy cav, plus Stannis Brocker go together pretty easily. The Cav pieces have lots of parts, but the fit is good and the modeller is allowed to apply a little variation to each figure. Nice. Stannis is actually the easiest model of this bunch to build. I also applied a little liquid green stuff to fill in joints, glued down the basing material...and good to go. Despite the amount of metal to be painted on these figures, I opt for a white undercoat. I want all the infantry and cav in this army to be as bright as possible...given the camo greens and dark metal that will cover most of the pieces. Next up is a dark wash to pre-shade and settle into the recesses of the figures. And that's where I got to this week. Spent my hobby time this week getting the beige camo layer onto one more Merc 'jack for the Damiano project. Not too much new here, so I thought I'd document the masking process I've been going through for M81 Standard Pattern paint scheme. Start with laying out a number of small pieces of low-tack masking tape. Then take a sharp X-Acto knife and cut an organic pattern into each piece. Apply the pieces to various areas on the green/brown 'jack. Fill in all the space between each piece with more tape. This turns out to take a while...so patience. It takes a surprising long time to do this step...you don't want any overspray on other areas of the model. Spray beige, remove the tape...and there you go. Camo paint layer number 3 is on. One more 'jack to go. Abbreviated hobby time this past week, so just pressed forward with more masking work on the Merc 'jacks. This week got the weapon arms and one more Mule taped off for the beige layer spraying. And slowly but surely the project pushes forward. Once I have the final two 'jack chassis sprayed for beige, I'm going to move onto the final dark brown/black camouflage layer of the paint scheme. 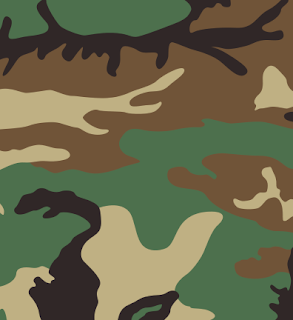 OK, I really wanted to do a cool scheme on these jacks...so I decided to get inspired by one of the most recognizable post-WWII camouflage schemes around...US Woodland pattern. 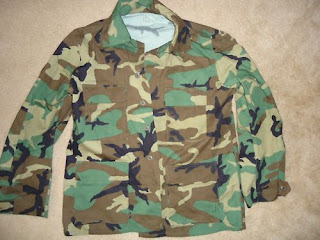 Also known as M81 General Purpose Pattern, this camouflage scheme was in use for over 20 years by the US military, and by numerous other countries. Painting this four-color pattern on four 'jacks was going to be challenging and time consuming...I wanted to get started right away. Assembly first. I kept weapons off for the time being, as I needed good access to the models to render the scheme. All the bits got pinned and attached to cork for easy painting. The 'jacks got attached to cylinders for ease of handling...and then all the pieces were primed black. The first color down was Vallejo Air Model Camo Light Green. I then started the laborious task of masking for the second color...which was going to be Camo Light Brown. Masking takes a long time. Be patient. Drink a lot...of alcohol. The results are worth it. The brown sprayed on nicely, and the foundation is there for a good camo scheme. All the masks were removed, and then new ones were applied for the beige pattern. This step used up the most tape so far, and took a long time. There is a lot of X-Acto knife work to cut the patterns into tape. Drink more. However, when tape came off, I was very happy with the result. The beige is Vallejo Model Air...a 50/50 mix of Hemp and Sand. Now it's on to masking and spraying beige on the other three 'jacks. When I was 11, I lived at Bathurst and Eglinton in Toronto for a year. I was in grade 6. It was 1974. My family moved around a lot when I was a kid, so I never had friends for a long period of time. Seems like I made news ones every year in a new town and then moved on. Never kept in touch with most of them. In this particular year, in this particular location, I met Trevor. Great friend. Fun guy. We played lots of games and built models together. We enjoyed school at North Prep. We really got along well. And then my family moved again. I made some effort to stay in touch with Trevor, but in a time before email and texting and the internet...it really was tough. I made new friends in new towns, but always thought it was a shame that I couldn't spend time with Trevor again. By chance, we ran into each other at Mr. Gameway's Arc (a game store downtown in Toronto) some years later. We rekindled our friendship for a time, but it was still difficult to stay in touch. Soon we were off to post-secondary, and our careers, and that was the last time we were in contact for a long, long time. A couple of years ago, we re-connected (thank you email!). We started a long correspondence, trying to fill in the gaps of all that lost time. Every email was a trip down memory lane for a different portion of our lives. Recently, Trevor wrote me about the summer of 1979. This note really struck a chord with me, as we both had identical interests at the same time...and although we weren't sharing our experiences together, upon reading this, I felt that I could have been there...I was there. The summer of 1979 is remembered with huge love and great excitement. Nothing else mattered. Days were spent reading...tracking down resources (“high impact” dice, rulebooks and manuals, Ral Partha miniatures). We would phone each other excitedly about finding a game store called The Four Horsemen out on the Danforth...or a new store called Tolkien’s World on Yonge that carried impossible-to-find modules from Judges Guild...a fantastic new shop on Parliament called the Battered Dwarf that had tons of figures and Dragon Magazines! We counted down the days until the eagerly anticipated Dungeon Master’s Guide finally arrived at Gameway’s Ark...”did you see the article about D&D in the Star?! ?”...hours and hours and hours spent poring over graph paper making maps and lore and worlds of high adventure! Eldritch and arcane stuff fascinated and beckoned...used bookshops were mercilessly searched for fantasy paperbacks that Harbour said we should read...and he was (mostly) right! We were totally obsessed. There was nothing like this. It was all we wanted to do or talk about. “My character this...my character that...” Bla bla bla! If we weren’t playing it then we were talking about it. What was this thing? Was this our generation’s “Beatles?” We became reduced to shrill teens swooning at the very mention of this game. You were either part of it or not. You “got it” or you didn’t. It wasn’t possible to explain to someone. It just wasn’t. We would set up and demo for those interested to watch. Usually their patience ran out and they would rise and shake their heads...mutter something about “I don’t understand this” and leave us alone to our mad, inexplicable ‘thing’. Basements all over Forest Hill were occupied nightly by us as we moved from secret locale to hidden base...our imaginations out of control with this plaything of ours. We became a secret club of sorts...it was beyond glorious! Some mothers objected to the strong language and imagery we indulged in. Magic? Demons? This isn’t healthy... Religions? Alignments? Moral dilemma...solving problems through gratuitous violence...male sexual fetishes and adolescent power fantasies became many a mother’s worst nightmare. Or their thesis in the case of Ted Verno’s mom. She was a husky voiced leftist feminist who would listen to our rantings and provide unbidden commentary from other rooms of the house. Cal would go into lascivious and perverted details (and quite informed...he was a sea cadet!) about exactly how he would bind female captives or Sean always wanted to rescue some maiden and then have his way with her right then and there. Verno’s mum would be off in another room shrieking about us about what deranged closet rapists and misogynists we were. Actually, I just thought it was funny. But then I was also told I was a lunatic and demented...so who am I to judge?? 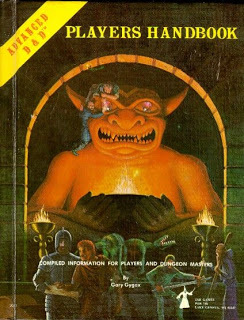 And in the States there was a high profile case about a teen who went missing while playing a “live version” of D&D in the steam tunnels of a university. “This is dangerous, devil worshipping stuff!” cried the mundane. The detractors and Bible belt types massed and screamed and damned us all. Which made it even MORE exciting! Oh yes. We tapped into our egos and ids and imaginations and had a grand old time. A friend wrote to me recently and drew an analogy of giving all the kids in a kindergarten class a big bag of candy in one hand and a loaded Uzi in the other. Yeah...that sums it up nicely. Good one, Paul! And like any addict, we needed our fix. The ‘game’ slowly stopped and reality took over. 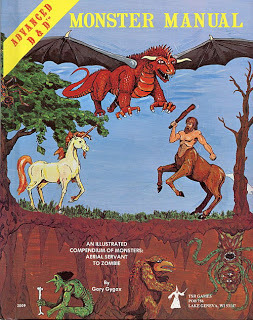 AD&D was usurped by other RPG’s that better catered to my friends'...um, needs. I became a sort of Doctor Feelgood and gave these poor, broken half-formed souls the ‘drugs’ they needed. Role-playing became a psychological crutch for some of these brilliant boy/men and we were about to go down the rabbit hole into a unique kind of madness.